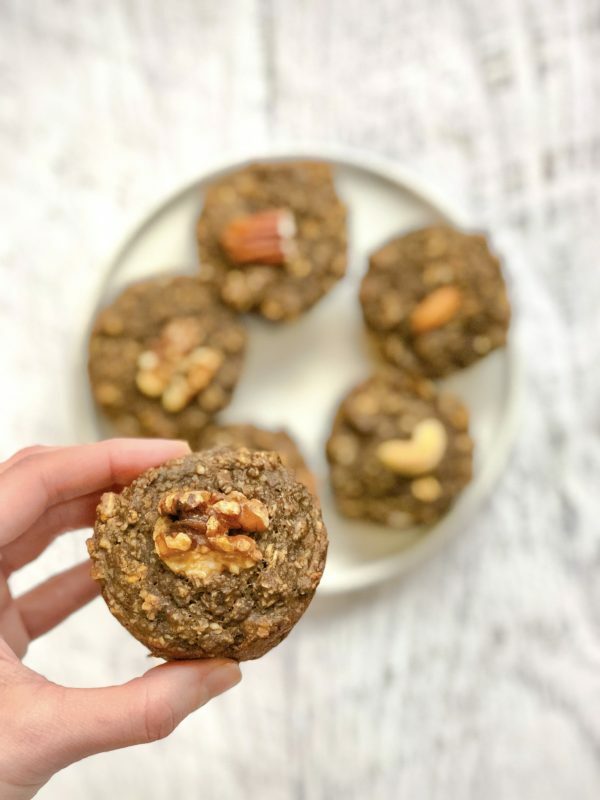 These Energizing Nutty Muffins are the perfect way to fight off the post-mini-vacation blues. Rob and I were away in Florida this past weekend visiting my amazing nephews, sister, and brother-in-law. It was the perfect weekend. I even convinced Arthur, my 5 year old nephew, to try broccoli! When we arrived back in New York, I was a bit blue, and decided to improvise in the kitchen to take my mind off how much I miss my family in Florida. These muffins resulted! They’re delicious, nutritious, added sugar free, and perfect for busy mornings. The frosting is optional and definitely worth trying for some extra sweetness. Try them out and let me know what you think! Start by making the chia egg: combine 1 Tbsp chia seeds with 3 Tbsp water in a small bowl and let sit. If making the frosting, soak the cashews in hot water! Soaking them for over an hour yields the best results. Place 3/4 cup of the mixed nuts into a blender and blend until the mixture resembles a chunky flour. Place the nut flour, the remaining nut mix, rolled oats, oat flour, coffee flour, hemp protein, baking powder, baking soda, cinnamon and salt into a bowl. Stir to combine. Add coconut milk, mashed bananas, almond butter, and chia egg to the bowl. Stir to combine. Grease the muffin tin with coconut oil and transfer the batter evenly into the tin. Set the oven to 350F and place the muffins in the oven to bake for about 20 minutes until risen and cooked through. While the muffins are baking, combine the frosting ingredients in a blender and blend until smooth. Once the muffins are finished baking, take a moment to enjoy the enticing smell of these delicious homemade muffins before eating! Top with the frosting and enjoy!